Surely we wouldn’t have added this stadium to our database if it wasn’t for its site. It’s got no stands, so its capacity is basically all the asphalt poured around the field. How many people could safely fit there? Very likely more than we suggest (500), but then the population of Henningsvær isn’t even that high, so we feel safe with 500. The stadium itself offers synthetic field and floodlighting for evening games, though of course it wouldn’t suffice for TV broadcast. TV or not, it’s enough to allow the amateur club Henningsvær IL to train four groups of local kids! 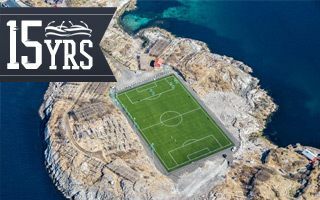 This “viral stadium” lies literally at the end of the road and only since 1983 has Henningsvær been accessible by road. The stadium was built by leveling solid bedrock of the southernmost part of the Hellandsøya island, resulting in a very rough landscape, decorated by overwhelming number of stockfish racks for dried cod. Ironically enough for a fishing village, the racks are the only thing preventing the ball from landing in cold sea waters surrounding the place.